In generally good cosmetic condition all round, only a few small scratches to the top of the unit. 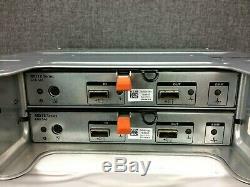 2 x SAS controllers (MD12 Series, 6Gb SAS, Dell P/N: 0W307K). 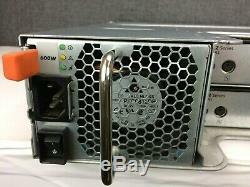 2 x 600W power supplies (Dell P/N: 0GV5NH). 12 x 3.5 HDD caddies (with screws). PLEASE NOTE - no front bezel, no rails. We can customise these arrays to order with a range of HDDs if necessary - please let us know your requirements. &###x200B;&###x200B;&###x200B;&###x200B;&###x200B;&###x200B;&##x200B. VAT invoices are provided with every order. We aim to resolve any problems quickly, and no customer with a genuine complaint is ever ignored. --PLEASE NOTE - no front bezel, no rails. --We can customise these arrays to order with a range of HDDs if necessary - please let us know your requirements. The item "Dell PowerVault MD1200 storage array with 2 x SAS Controllers and 2 x 600W PSU" is in sale since Monday, February 11, 2019. This item is in the category "Computers/Tablets & Networking\Enterprise Networking, Servers\Network Storage Disk Arrays\Other Network Disk Arrays". The seller is "tekkybitz" and is located in Irvine. This item can be shipped worldwide.